Specially designed to remove surplus water from both sides of prints on resin coated paper for rapid and even drying. 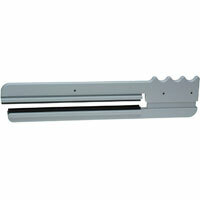 The 9in long, soft rubber blades ensure that prints will not be damaged. Suitable for prints up to 16 x 20in (40.6 x 50.8cm); Made from anti-corrosion materials, resistant to all photographic chemicals; Unique spring loading system on the floating action of one blade. Replacement blades available.